This is just a quick update: I noticed Wendy’s had a differently named seasonal fish sandwich so a return trip was in order. Was it a superficial name change or was it a complete overhaul? I had to investigate! Ever been faked out by your own taste expectations? Like when you want a Coke, you order a Coke, you’re expecting a Coke but when you take a sip you realize it’s iced tea? That’s what the fish sandwich from Wendy’s was like. I remember how the previous Wendy’s fish was battered and fried with either the same seasoning or oil as their chicken sandwiches/nuggets. 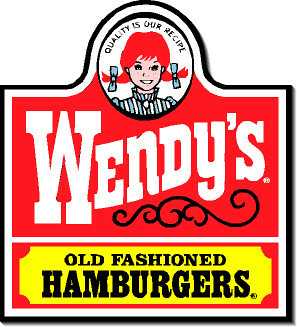 It was distinctive — it tasted like it came from Wendy’s. But when I took a bite of their Premium Cod Fillet Sandwich, I wondered if I had picked up a fish sandwich from a local high school. With its newly unseasoned, deep-fried quadrangle of Panko-coated North Pacific cod, Wendy’s falls to the back of the fast-food pack. 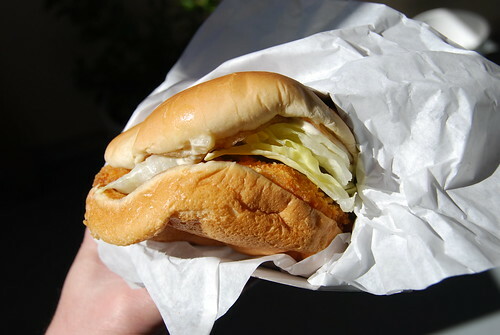 There was nothing in this fish sandwich that differentiated it from the likes of Jack in the Box, Sonic, A&W or any random greasy spoon you’d see on a road trip through the middle of nowhere. I lost interest in the sandwich so quickly that I didn’t even bother taking a second photo of it. Whatever memories you may have of Wendy’s Premium Fish Fillet Sandwich, cherish them… because this sandwich is not the same. Even the bun has been downgraded to a boring, toasted roll. 510 calories, 26 grams of fat, $3.49. That sandwich looks like the type they serve at my work (which is a high school and which is why I never buy lunch from the cafeteria), except they have a boring wheat bun so the kiddies won’t get obese. We liked the premium cod fish sandwich very much the first two visits. But the last visit yesterday indicated that the food formula had changed. The sandwich was just so-so.